Educational toys are a booming industry with sales in the billions every year. But, the fact of the matter is that for young children, almost everything can be educational and you truly don’t have to shell out a dime to have some quality learning time with your toddler. 1. Nature. Beyond battling ‘nature deficit disorder’ and increasing health and well-being on a variety of levels, getting outside is intrinsically educational. Considering all of the sights, sounds, smells, colors, textures, species, and more, nature is an unbeatable teacher. Smell flowers, look for bugs, make mud-pies – all of it is basic education for a toddler just beginning to understand the world. And, you can bring the outdoors in, too! Fill a basket with small stones (not so small your child could choke on them), sticks, and pinecones and you have an instant kit for teaching your child to build, sort, and count. 2. Books. Make library visits a part of your weekly routine. Reading together is a rich experience that supports language development and nurtures your bond with your child. Story-telling can also be quite powerful. Make your child and people she knows into characters for some of your stories. Use both everyday events and time-honored tales. 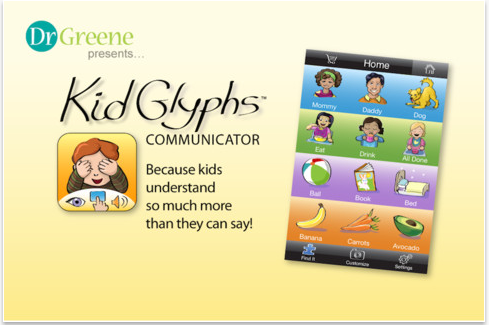 KidGlyphs – our iPhone app that uses graphics, spoken words, and text to help children communicate beyond their verbal skills. Reading Rainbow – a free platform for books and digital field trips, which includes one free book and one free field trip. Feel Electric! – an app from Sesame Street that helps kids learn their moods and words to describe them. Children absolutely love these – however, they can be even more addictive than TV. Use them as enrichment, but don’t let them act as a substitute for your attention and involvement. Don’t let them supplant the wonder of the real world all around us. Toys claiming to be educational can be powerful tools. Nevertheless, don’t be lulled into the misconception that they are necessary for your child’s development or that more is better. Many studies have shown that even the most deprived environments are full of opportunities for learning and play. It’s not about what you have, it’s about what you do. Do you have any recommendations or tips to share? get 4 emails with the exact same comment. Perhaps there is an easy method you are able to remove me from that service? can improve your credit scoring.